Two students from the University of Kentucky and one 2006 alumna have been selected as recipients of Fulbright U.S. Student Program scholarships. The UK recipients are among 1,700 U.S. citizens who will travel abroad for the 2012-2013 academic year through the prestigious program. 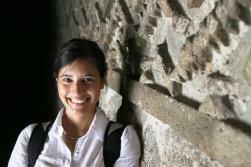 Verónica Miranda, a doctoral candidate in anthropology, who will do research in Mexico. Amanda Gatewood, who currently works as an epidemiologist for the Kentucky Department for Public Health in the Early Childhood Development Branch, completed a Master of Public Health in maternal and child health at University of California, Berkeley School of Public Health in 2010. She will use the Fulbright grant to study the association between breastfeeding and early childhood stunting in Kyrgyzstan. "My first job out of college was as an English teacher in Kashgar, East Turkestan, which is a colonized region of China near the border with Kyrgyzstan. There I saw widespread water- and food-borne illness," Gatewood said. "Sanitation and food storage are the low-hanging fruit of public health. It doesn’t take expensive laboratory equipment or pills to teach people to manage latrines. I knew this was an area where I could make a difference. It took six years, but I’m finally returning to Central Asia with the public health skills necessary to make a dent in the health problems I saw." Johnson, the son of Kenneth W. and Sally Johnson of Louisville, Ky., received his bachelor’s degree from Berea College in 2009 and is currently completing his second year at the UK College of Law. He will spend the next year teaching English in Malaysia before returning to complete the final year of his law degree at UK. "Southeast Asia is a region of rapid economic growth, and Malaysia is one of its most robust economies," Johnson said. "By helping to increase the use of English among future generations of Malaysians, the Fulbright program is building a stronger relationship between our countries, and I am excited to be a part of it. I believe that representing the United States in this capacity will better prepare me for overseas federal service in the future." The law student feels his studies have been a great training ground to prepare him for this opportunity. "The study of law appeals to me in part because it has helped me develop the capacity to take concepts which are sometimes very complex and break them down into manageable parts that are readily communicated to others," said Johnson. "Although the connection between law and education may not be immediately apparent, the process behind making a legal concept accessible to a jury or a client is not unlike the process behind making a new language accessible to students. Indeed one of the challenges facing a new law student is learning the 'language' behind the law. In this sense, I can apply skills developed during my legal studies to further the United States’ and Malaysian interest through the Fulbright program." Miranda, who has a bachelor's degree from Humboldt State University and two master’s degrees in education from Chaminade University and applied anthropology from San Diego State University, will pursue research on maternal health practices in Quintana Roo, Mexico, where she has extensive prior experience. "As an anthropology student and working anthropologist, I have been able to participate in numerous projects that have taken me throughout Mexico," Miranda said. "My first field experience took place the summer after my second year of undergrad. That summer, I participated in a U.S. lead archaeology project in the southern interior of the Yucatan peninsula. It was such an amazing experience to live and work in a rural Yucatec Maya community. It was so different from anything I had ever experienced before. Since then, I have returned to the same community six times and conducted ethnographic research." Johnson and Miranda applied for the Fulbright Award through the university's Office of External Scholarships, part of the Division of Undergraduate Education at UK. The Office of External Scholarships assists current UK undergraduate and graduate students and recent alumni in applying for external scholarships and fellowships funded by sources (such as a nongovernment foundation or government agency) outside the university. These major awards honor exceptional students across the nation. For the 2012-13 Fulbright Awards, the UK campus deadline is Sept. 10. Current UK seniors, graduate students and recent alumni have plenty of time to put together a competitive application, so interested students should contact Pat Whitlow, director of the Office of External Scholarships, for additional information. Since its establishment in 1946 under legislation introduced by the late U.S. Senator J. William Fulbright of Arkansas, the Fulbright Program has given approximately 310,000 students, scholars, teachers, artists and scientists the opportunity to study, teach and conduct research, exchange ideas and contribute to finding solutions to shared international concerns. Fulbright alumni have achieved distinction in government, science, the arts, business, philanthropy, education and athletics and won such prestigious honors as the Nobel Prize, Pulitzer Prize, MacArthur Foundation Award and the U.S. Presidential Medal of Freedom. Fulbright recipients are among the more than 40,000 individuals participating in U.S. Department of State exchange programs each year. For more than 60 years, the Bureau of Educational and Cultural Affairs has funded and supported programs that seek to promote mutual understanding and respect between the people of the United States and the people of other countries. The Fulbright U.S. Student Program is administered by the Institute of International Education. For further information about the Fulbright Program, visit the website www.fulbright.gov. The last year has seen several UK students earn regional and national recognition for their academic work from prestigious scholarship and internship programs. Last summer, graduating senior Taylor Lloyd received one of only 26 scholarships from the Astronaut Scholarship Foundation, presented to outstanding college students majoring in science, technology, engineering or math. That same summer, four UK students, Christiana Holsapple, Desiree P. Jones, Joshua Koontz and Joshua D. Smith, were awarded the National Security Education Program David L. Boren Undergraduate Scholarship, which provides select undergraduate students opportunities to acquire skills and experiences in countries and areas of the world deemed critical to national security. In the spring, eight more UK students received recognition. Nicole Schladt and Sarah Smith were awarded two of six English-Speaking Union Scholarships presented by the English-Speaking Union Kentucky Branch for summer study at the University of Oxford and University of Cambridge respectively. UK's Jillian Harris was named one of 191 finalists for the Harry S. Truman Scholarship. In March, Aleksey Graboviy and Nolan Jackson were awarded two Henry Clay Internships presented by the Kentucky Society of Washington to work in an office of a member of the Kentucky congressional delegation or an office of the executive branch. In April, three more UK students received honorable mention recognition from two national scholarship programs. Stratton Hatfield was one of 50 students to receive an honorable mention from the Morris K. Udall and Stewart L. Udall Foundation scholarship competition, which supports sophomores and juniors committed to careers related to the environment, tribal public policy or Native American health care. Later the same month, Josiah Hanna and David Spencer received honorable mentions from the Barry M. Goldwater Scholarship and Excellence in Education Program which recognizes students on the basis of academic merit in mathematics, science and engineering.